Today’s ride started at the bike shop for a new helmet, and oh my, what a pleasure it is to have a local bike shop. I tried on some lids and had a completely lovely chat about helmet philosophies and training diets (she prefers the ice cream program over my pizza plan) before setting off for a roll down the hill. I meant to go to the Kinetic Sculpture Race, a most wondrous festival of giant floats on bicycles, racing, but in spite of the obvious pleasure of that sort of event for a person like me, I just wasn’t in the mood for crowds. Instead, I biked down through Little Italy and up Bank Street toward Patterson Park. 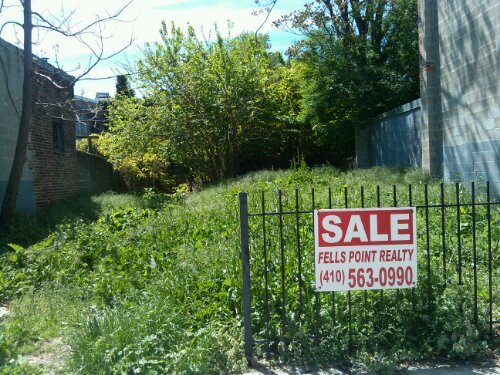 I snapped this picture of an empty and overgrown lot for sale just before Caroline. The part where this spot can exist mere blocks from the hyperdeveloped areas of Harbor East and Fells Point blows my mind, as a newcomer to the city, anyway. I didn’t live here when they decided to build so much public housing downtown, when all the rich people were taking the new highways to the booming suburbs. I live in Baltimore now, when there’s a reversal, and downtown is being developed as live-work-tourism space. I wonder what the city will do with areas like this, Perkins Homes, as the real estate becomes more valuable. For now, this spot is offered by Fells Point Realty, perhaps a sign that that neighborhood’s creeping north. The way things look now, I will be here to watch those developments. The rest of my ride was all a marvel at wispy clouds, ridiculous blue skies, brilliant greens, and a traffic jam of bikes on the Fallswat heading home. Yep, spring is here. Lucky, lucky us.